This 5" x 7" fine art print was made from an original multi-layered acrylic painting. 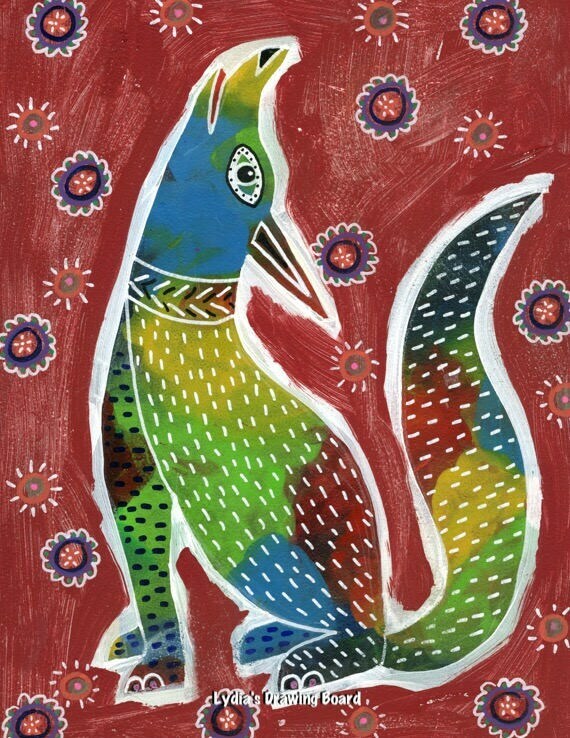 This is a coyote that is inspired by Oaxacan wooden animal carvings. Prints are done by the artist at her home on an Epson Stylus Pro 3880 using Epson UltraChromeK3 archival inks on Epson Ultra Premium Presentation paper. The print is open edition, hand signed and dated by the artist. It comes with cardboard backing and in a protective cellophane bag. The print has a small white border for framing, with or without matting. The watermark will not appear on the print. © 2017 Lydia A. Eloff. All artwork is subject to copyright and not authorized for use without prior permission. All rights reserved.